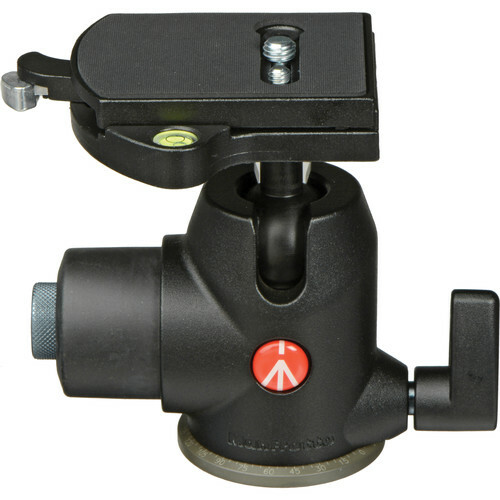 This 468MG Hydrostatic Ball Head from Manfrotto includes an integrated RC4 quick release cam lock and a 410PL Quick Release Plate. RC4 compatible quick release plates such as the 410PL can removed from the head by pulling the cam lock's spring-loaded lever, which also allows the plate to be instantly reattached. The 468MG Hydrostatic Ball Head with 410PL Quick Release Plate features a ball-and-socket joint that utilizes pressurized fluid, which helps to provide a 35.3 lb load capacity and an easy-to-tighten locking mechanism. By loosening the 468MG Hydrostatic Ball Head's primary locking knob, the ball-and-socket joint can be quickly swiveled, angled, fully tilted, or returned to its upright position. An additional knob set within that locking knob can be rotated to apply tension control to the ball-and-socket joint's movements. Along the opposite side of the ball head, a secondary locking knob controls the ability to rotate the head 360°. Cameras or accessories that are compatible with a 1/4"-20 or 3/16"-20 mount can be connected to the 410PL Quick Release Plate, which measures 2.5 x 3.3 x 0.5" and has a rubberized, non-slip surface. 468MG Hydrostatic Ball Head with 410PL Quick Release Plate is rated 4.2 out of 5 by 19. Rated 5 out of 5 by Gregory K from My Favorite of the Manfrotto ball heads The qualitative difference between this head and the other 468MGRCs is the size of the platform/QR plate - it is the only factor that gives this particular head the highest load-bearing rating. It locks down very firmly and very quickly and will not be budged. If I had to pick a beef - the tension adjust on the fixing knob doesn't seem to do much; I'd like a little more of a range of tightening thresholds so that I can ease over to vertical format a little less abruptly. This is the only ball head I use anymore - much faster and more solid than even the Linhof. Rigidity is superb - absolutely no flex when it's fixed. Rated 4 out of 5 by Big Camera Shooter from Works For an 8x10 Camera I spent several months on and off looking for a head light and small enough for backpacking while being stable enough for a 16-pound camera. After using it for several months now, I feel I made the right choice. There is no play in the quick-release plate where it connects to the head. When tightened, the head locks securely with no fear of slipping. The drag adjustment is necessary for a large heavy camera like mine so it won't get away from me while I adjust it. While my use may be considered quite demanding, I'm giving it 4 stars because the padded QL plate is a bit too small and causes the camera to rock a bit. Also, the 1/4 screw supplied was way too short for the camera and I had to buy a 2nd plate, drill it out and put in my own screw. All in all, for more demanding users, it is the best combination of compactness, light weight, speed of use, rigidity and price that can be found. Rated 4 out of 5 by Monday from A Great Upgrade This is a great ball head. It cost a little more than my last head but worth the extra $$$. I say this because it does the most important thing, it holds the camera stable, does not more, after you have focused in on your subject. Rated 5 out of 5 by Charlie from Excellent ballhead. I have had mine for 4 years and it performs flawlessly, even when left in my car at minus 25C. Used for Nikon D700 and D800 and for Mamiya RB67. Really like the ease of of tightening and release and the ability to adjust the friction to the camera weight. The plate is totally secure and locks without leaving any movement. Also like the quick release with safety lock.which gives extra security when removing the camera. I have several plates on different bodies and lenses. The release and attaching is instantaneous without any issues. Yes I would buy again. Rated 4 out of 5 by Boat Builder from I really like this ballhead I've owned this for about two years and I like it more and more. Used with a Nikon D800e, Hasselblad and 4x5 view camera, it's well made, smooth and doesn't budge once locked down. It's a little heavy (so four stars rather than five) but I still take it with the Gitzo GT253 on many day hikes. Quick release is difficult to use until you realize that you move the lever first and push the button second, then it's great. I would buy again. Rated 5 out of 5 by Gil from Great Ballhead for the price Very solid performance, the RC-4 Plates are lightweight and very strong. I am able to support 3 different formats, with the ease of interchangeabilty without worrying if the camera will hold or not. When the plate locks, a quick tug, and i'm ready to shoot!!! Rated 5 out of 5 by George from Excellent ball head Purchased one of these in 2006 together with manfrotto 4 section carbon fibre tripod. Both have been excellent and have never let me down. The ball head often stays in the car in temperatures down to -20C and always works. Used with mamiya RB 67 and Nikon D800. Recommended. If I bought again would probably go with arca plate although the manfrotto one is rock solid. Can you fix the wimberly C-12 quick release clamp to this MGRC4 ball head? Yes. According to the instructions included with the C-12, you would follow the installation chart listed in column B for use with the Manfrotto 468MGRC4 (they list the 468MG RC 0, 2, 3, 4, and 5 on the instillation chart as compatible with the C-12 quick release clamp). Can I use this with a 679B Monopod? Yes. The Manfrotto 679B Three Section Monopod has both a 1/4 -20 &amp; 3/8 -16 thread on the top of the monopod. As the Manfrotto 468MGRC4 Hydrostatic Ball Head has a 3/8 -16 tripod socket on the bottom of the head, it would be compatible for use with the Manfrotto 679B Monopod. 192/5000Once the horizontal and vertical level has been set, is it possible to set the 360 rotation independently without any risk of modifying the two already adjusted axes? Thanks for your help. Can you attach a Glide gear arm to this tripod? The short answer is Yes , so long as your glide gear will mate to a 1/4 screw in the head mounting plate (same as your camera). Depending on the load of the glide gear, this head will support 35 pounds; there are stronger heads available, but most at a higher price --- all depends on what your requirements are.